As a skier, one of the biggest problems you run into is getting all of your supplies from point A to point B. There are a number of pieces of equipment necessary to go skiing, from goggles, to gloves, to clothing, and more. Probably the most important piece of equipment (other than your skis, of course), is your boots. In order to take your ski boots with you, you need something to carry them in. What you need is the Best Ski Boot Bag. These roomy bags are designed to fit on your back, allowing you to take a large amount of equipment from place to place with ease. The Best Ski Boot Bag for air travel is specially made to accommodate boots and other skiing equipment. 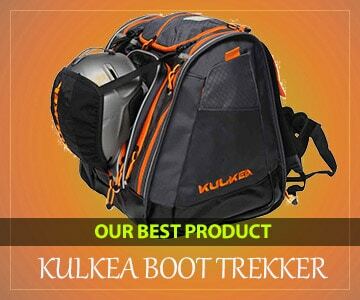 The 69-liter Kulkea Boot Trekker is the most high-quality, innovative, and technically featured boot bag on the market. There’s a lot going on here, but let me try to give you a little overview of some of the features of the bag. First, it’s a compartmentalized solution. Let’s start with making more space on the inside. By keeping helmets on the outside to allow them to ventilate properly, what was once just a 69-liter bag suddenly feels much larger, due to all the saved space inside of the bag. The front pocket is perfect for hand warmers, lip balm, and other small items. In the top pocket, you can put your face mask, balaclava, bandana, or whatever you want right there. The front main compartment can easily hold a water bottle or goggles in a microfiber-lined pouch. Additionally, there is a very large top pocket for your ski pants, base layer, and even your jacket – all the big base layer items can fit right in here! Boots go in the sides, one in each pocket. They can also go in the back by just sliding in. The pockets are built so that the boots are in a ventilated area while they’re in the bag. The Kulkea Boot Trekker also has what are called sock pockets that run down the side of each pocket, while the front of the bag includes storage areas that allow for one glove on the left and one glove on the right. The bag itself, made from a high six denier ballistic nylon, is made of the highest quality material, with only YKK zippers used. There’s a sternum strap that attaches to a hiking grade support system at the back and a heavy duty waist belt that is attached by Velcro, thereby making it removable if necessary. The bottom of the bag is fully lined with waterproof tarpaulin. Double grommets are included where the boot pockets are to assist with drainage. There are so many awesome features that I’m sure I have probably missed at least 10 more things, but the Boot Trekker is by far the best bag in the market! Looking for a massive boot bag to carry just about all of your ski equipment? If so, the Kulkea Boot Trekker is the bag for you. With 69 liters of total storage capacity, it can easily fit your boots, clothing, gloves, goggles, valuables, and more! The dimensions of the bag are 18 x 14.5 x 18 inches, making it big enough for boots up to approximately a size 13. Made out of durable, yet lightweight polyester, it weighs in at just 4 pounds when empty, making it very easy to carry around. Water-resistant and equipped with drainage grommets, it ensures that water is not able to settle inside. Equipped with a number of both small and large pockets, this bag includes compartments for boots, valuables, clothing, small items, and more. Possessing soft, adjustable shoulder straps, it can be carried around on your back with general ease, allowing you to hold onto other bags if necessary. Essentially, the Boot Trekker is a huge boot bag that can hold a huge amount of equipment. It doesn’t matter if you’re a beginner or seasoned skier. If you have a lot of equipment to store and transport, this bag will surely get the job done. While it’s a little expensive, its durability and functionality make it worth the price. Looking to find a high-quality boot bag for the least amount of money possible? If so, you might consider the Athalon Everything Boot Pack. Available for just under $60.00, this bag still offers plenty in the ways of construction, storage space, and carry-ability. Measuring in at 17 x 14 x 15 inches, and weighing in at around 3 pounds, it’s fairly compact, making it great for those who prefer to carry bags on the smaller side. At its max, it can accommodate boots of around size 12. Possessing around 50 liters of storage capacity, it’s big enough to fit boots, goggles, clothing, valuables, and more. Equipped with a number of both small and large pockets, this bag is capable of transporting items of all shapes and sizes. 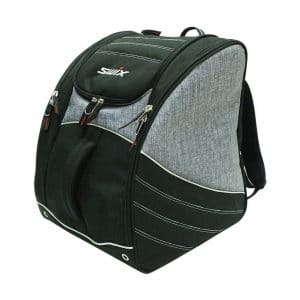 It sports comfortable and padded backpack straps, allowing it to be taken from place to place with general ease. Made out of polyester, it does a fairly good job of withstanding wear and tear. All in all, the Everything Boot Pack is a terrific ski boot bag for casual skiers who don’t travel a lot. While it can easily transport all of your equipment from point A to point B, it’s not quite as durable as high-end ski boot bags. Available for a very reasonable price, it’s a great buy for those who don’t want to spend too much. Are you looking for a boot bag that’s as easy to carry around as a typical backpack? 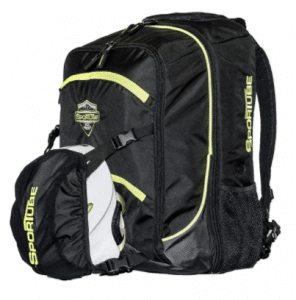 If so, you might consider purchasing the Sportube Overheader Boot Bag. Possessing a thin, aerodynamic construction, it can be strapped tightly to your back to prevent unnecessary movement and sway. Made out of 840D poly materials such as polyester, this bag is both lightweight and durable, weighing in at just 2.5 pounds when empty. It measures in at 15 x 10 x 22 inches, and is capable of storing boots up to around size 13. With 50 liters of total storage area, it’s on the small side compared to most ski boot bags. It might not be able to fit quite as much equipment as more typical ski boot bags. It possesses a number of different pockets, including a large pocket for your boots, small pockets for valuables, socks, and other little items, and medium-sized pockets for clothing, water bottles, and otherwise. Users who have brought it on planes have noted that it’s compact enough to fit into overhead storage areas. All in all, this Sportube bag is a terrific bag for all carrying purposes. Due to its compact size, it makes an especially good bag for those who often travel by plane. Though it’s a little expensive, it’s designed to withstand quite a few years of wear and tear. 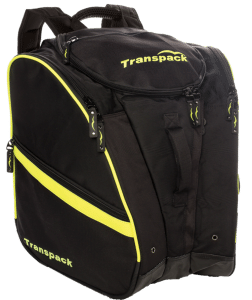 If you’re looking for the best overall boot bag on the market today, the Transpack TRV Pro is the boot bag for you. Combining large store capacity, durable construction, and tons of storage compartments, it’s a bag designed to get you through all gear transportation situations. Made out of tough, but lightweight polyester, this durable bag weighs in at just 2.5 pounds when empty. A wide, spacious bag that measures in at 20 x 8 x 20 inches, it possesses 54 liters of total volume, giving you plenty of room to store all of your equipment. It can store boots up to around size 13. This bag is equipped with 4 total pockets, including a large one for your boots and clothes, and 3 small ones for valuables and tiny items. While it doesn’t provide you with as many storage compartments as the Sportube bag reviewed above, it still has more than enough ability to store all of your belongings. In summary, the TRV Pro is the best ski boot bag currently on the market. No other bag does as superb a job of combining carry-ability, storage space, comfort, and functionality. Though it’s a little expensive, it’s a great bag for both beginners and serious skiers alike. Are you looking for a high-quality boot bag, but would like to stay under or around $100? 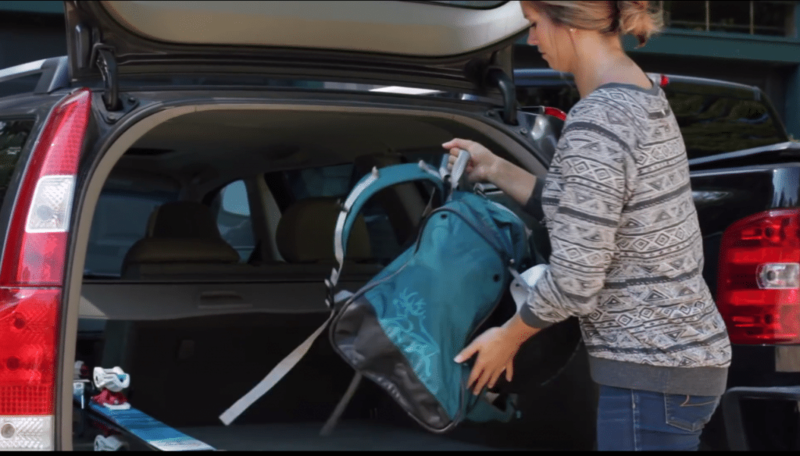 If this is the case, the Thule RoundTrip Boot Backpack is the bag for you. Available for just under $100, this bag still provides more than enough in the ways of storage capacity, comfort, and overall functionality. This bag contains around 55 liters of total storage space, weighing in at just 2.5 pounds, and measuring in at 14.5 x 19.25 x 13 inches. This means that it has plenty of room to store everything from boots, to clothing, to valuables, and more. At its max, it can store boots of around size 13. The great thing about this bag is that it’s relatively thin, allowing it to be stored in most airplane overhead storage compartments. Made out of polyester, nylon, and tarpaulin, it’s designed to withstand quite a bit of wear and tear. Equipped with a number of different pockets, it will accommodate items both small and large. In summary, the Thule RoundTrip offers superb value for its price. As functional as a lot of the more expensive boot bags, it’s great for skiers who need the highest quality without spending too much money. Measuring in at just 15.5 x 13 x 16 inches, the Kulkea Powder Trekker stands out for its compact size and ability to be stored. If you travel a lot or have a need to pack your things as tightly as possible, this is the bag for you. However, it should be noted that this bag can only accommodate boots of size 10.5. If you wear that size or smaller, this bag will suffice. If you go bigger than that, there’s no chance that this bag will help you. Possessing 52 liters of volume and weighing in at just 2 pounds when empty, it’s very spacious for its light weight and small overall size. You shouldn’t have a lot of trouble storing your boots, clothing, and otherwise in this bag. Equipped with a number of both small and large pockets, it can easily fit both your small and large items. In addition, it sports comfortable, padded shoulder straps to allow for easy transport from place to place. For those who are on the smaller side, the Powder Trekker is a great boot bag. Its ability to be stored away compactly makes it extremely valuable compared to other bags. Available for a very reasonable price, it’s a great bag for anyone who wears a size 10.5 or under ski boot. If you’re looking for a decent ski bag that’s available at or under $75, the Swix Road Trip Tri-Pack is the boot bag for you. It possesses plenty of storage space, tough construction, and padded straps. This bag is made out of a combination of polyester and tarpaulin, giving it durable and waterproof qualities that will keep it thriving for years and years of use. It’s also equipped with drainage holes to ensure that any excess water is able to escape freely while it’s being used. Possessing around 55 liters of storage space, measuring in at 18 x 15 x 14.5 inches, and weighing in at around 2.5 pounds, this bag can accommodate ski boots up to a men’s size 11.5 in size. Equipped with plenty of pockets, it will have no trouble storing your boots, gloves, clothing, valuables, and more. For comfort and transportation purposes, it’s equipped with wide, padded straps. Available for a mid-level price, the Road Trip Tri-Pack still offers quite a bit in the ways of durability, comfort, and storage. 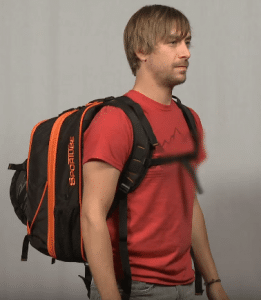 If you’re a beginner or casual skier, this would make a great bag for you. Seasoned skiers can also make use of it, but they might find more success with a more high-end bag. 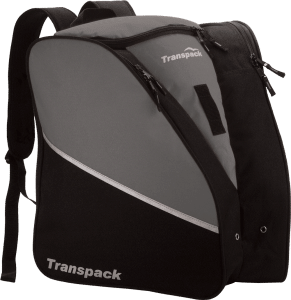 While it’s not as nice as the high-end ski boot bags, the Transpack Edge Isosceles Bag is a terrific bag available for under $60. 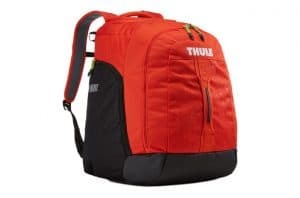 It combines excellent construction quality and storage capacity to make a bag that will get you through all ski equipment transportation situations. Made out of water-resistant polyester, it not only keeps water out, but also does a great job of withstanding wear and tear. It weighs in at just 2 pounds, and measures in at 17 x 18 x 15 inches, making it big enough for boots up to around size 12. Overall it possesses around 50 liters of storage capacity. Equipped with comfortable, padded, and adjustable shoulder straps, it fits snugly to your back regardless of your size or shape. Sporting a number of different pockets in a number of different sizes, it can easily store your boots, valuables, clothing, and more. All in all, the Edge Isosceles is a great boot bag for novice skiers. It doesn’t fit quite as much as high-end bags, but it will work excellently for local ski trips and the like. If you’re looking to travel long distances with your bag, we suggest purchasing something with a little more room. 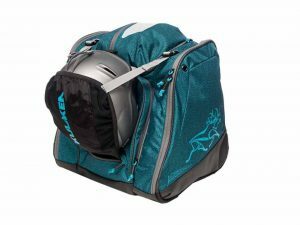 If you’re just a casual skier who needs a bag to have on hand every once in a while, you might consider purchasing the High Sierra Trapezoid Boot Bag. Available at around $40, it’s not quite as functional as the more high-end bags, but it still provides enough functionality to get you by in times of periodic need. Made out of polyester, this bag is ventilated to allow moisture to escape throughout its use. It measures in at 16 x 13.5 x 16 inches and weighs in at just 0.62 pounds when empty, making it ridiculously easy to carry around from place to place. Possessing around 50 liters of storage capacity, it can fit up to size 13 boots. One of the downfalls of this bag is the fact that it only possesses 3 different pockets. So, while it should be able to store the majority of your gear, it can’t really keep it all separated and organized. Of course, this does nothing to take away from its overall comfort. Equipped with shoulder straps, it fits snugly to your back to prevent bouncing and swaying. If you’re a casual skier who only needs a boot bag every once in a while, the Trapezoid is the bag for you. While it’s not the biggest or most durable, it’s still functional enough to serve its purpose periodically over time. If you’re going skiing for the first time, and need a boot bag that will just get you by, the Stage Basic Boot Bag is for you. While it’s not a great bag to use consistently over time, it will work just fine for those who only ski every once in a blue moon. Made out of polyester, it’s fairly durable, but padded only lightly. This makes it a lot less comfortable than other bags on our list. Generally, it has enough room to store boots, clothing, valuables, and other essentials. If you’re looking to attach your helmet to its exterior, you might run into some troubles. One of the nice things about this bag is that it’s lightweight, weighing in at under 1 pound. Also, it’s capable of storing ski boots up to size 14, making it great for skiers of most foot sizes. 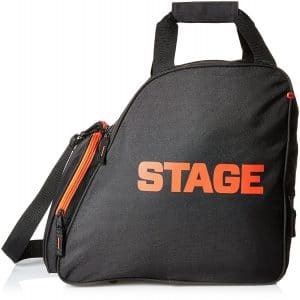 In essence, the Stage Basic Boot Bag is a nice budget boot bag. You’ll never mistake it for a high-end bag, but it does serve its general purpose of transporting gear from place to place. If you’re looking to spend the least amount of money possible, buy this bag. While most ski boot bags look similar from a distance, upon closer examination, you can actually see that they’re all quite different. There are a number of different things which separate ski boot bags. Before making a final purchase on one, you must take these things into consideration. They include the bag’s capacity, its storage options, its overall construction, and its overall carrying comfort. A boot bag is designed to fit quite a few pieces of skiing equipment. While obviously, it’s supposed to store your boots, it’s also meant to store clothes, valuables, gloves, and, in some cases, a helmet. Most ski boot bags range between about 50 and 70 liters in volume. Make sure that all of your skiing equipment is able to fit in the bag before making a final purchase. In terms of storage capabilities, not all ski boot bags are created equally. They possess different amounts and different orientations of pockets and flaps, from valuables pockets, to clothing pockets, and more. Get an idea as to what you’re going to be storing in your bag so that you can decide how certain pockets will accommodate your gear. You’ll be taking your boot bag to a number of different places, many of which will subject it to quite a bit of wear and tear. In order to withstand this wear and tear, your bag must possess top-notch construction quality. Most ski boot bags are made out of tough, but lightweight polyester. Read online user reviews in order to get an idea as to each bag’s construction quality and durability. Depending on how you use it, you might have to carry your boot bag around with you quite a bit. 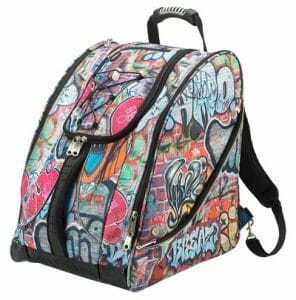 The majority of these bags are equipped with shoulder straps so that you can wear them like backpacks. If you’re going to be carrying your bag around a lot, you must ensure that it’s going to feel comfortable on your back. If you’re buying a boot bag, there’s a reasonably good chance that you’re planning on taking it with you during air travel. Before you do this, you should know that different airlines do have different luggage size restrictions. Let’s review the luggage size limits of the biggest airlines in the United States, shall we? Continental Airlines allows carry-on bags up to 51 inches in total length (length+width+height), and 40 pounds in total weight. For checked bags, this airline allows 62 inches in total length (length+width+height), and 50 pounds in total weight. Delta Airlines allows carry-on bags up to 45 inches on total length (length+width+height), and 40 pounds in total weight. Like Continental, they allow checked bags up to 62 inches in total length, and 50 pounds in total weight. Southwest, United, and US Airways are a little stricter about their carry-on maximums. While their carry-on weight maximums are the same at 40 pounds, their lengths differ. Southwest allows carry-ons up to 24x16x10 inches, United allows carry-ons up to 22x14x9 inches, and US Airways also allows carry-ons up to 22x14x9 inches. All three of these airlines allow checked bags up to 62 total inches (length+width+height) and 50 pounds in total weight. If you’re going to be air traveling with your bag, ensure that the airline is able to accommodate it. You can do this by figuring the measurements yourself, or by reading user reviews online. Skiing is fun, but lugging ski equipment around isn’t. However, that doesn’t mean that it has to be as difficult as possible. By purchasing a ski boot bag, you’ll enable yourself to carry your ski equipment around with as much ease as possible! The two best ski boot bags currently on the market are the Transpack TRV Pro and the Kulkea Boot Trekker. Both bags possess tons of storage capacity and are extremely comfortable when being carried around. If you want ski equipment transport to be as simple as possible, these are the bags for you. this web site contains remarkable and actually fine information designed for visitors. I am a skier on a low budget right now so the Athalon Everything seems like the best choice for me. I do have a big boot size though so I’m hoping it will still fit. I’m also not the strongest individual so I hope the bag doesn’t get too heavy. 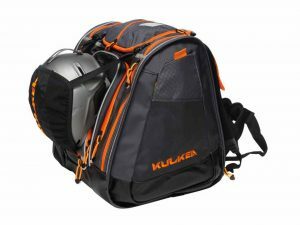 I love how the helmet holder part of the bag is on the outside of the Kulkea Boot Trekker. It makes it a lot easier to get your helmet in and out of quickly and without hassle. Plus, sometimes I like to switch my helmet up and they’re differently shaped so having a pocket might not work for all of them. I am a newbie to skiing and I totally didn’t even think about getting a bag to put my helmet and boots in for the drive up there and moving stuff around. I almost completely forgot it and we leave in a week. Since most of these are Amazon are they all eligible for the two-day shipping?